Conversations with Conservatives is a group of free-market and liberty-minded members of Congress who meet regularly to discuss the most important issues of the day. Each meeting features different conservative members of Congress. Guests so far in 2019 include Congressmen Jim Jordan of Ohio, Chip Roy of Texas, Mark Green of Tennessee, Warren Davidson of Ohio and Andy Biggs of Arizona. 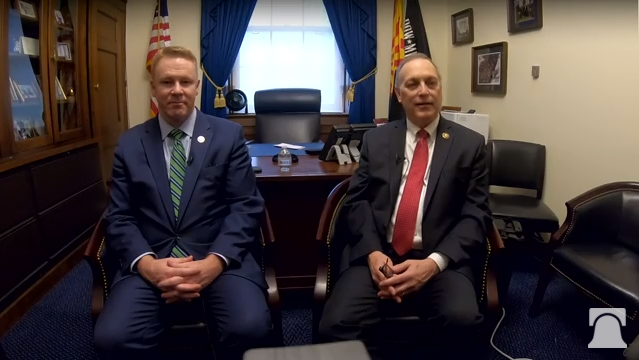 On Wednesday, Bluey moderated a conversation with Reps. Warren Davidson (R-Ohio) and Andy Biggs (R-Ariz.), who shared their reactions to the State of the Union. The meetings are streamed live on Facebook and Twitter and promoted on Heritage and The Daily Signal’s social media channels. The Heritage Foundation’s Rob Bluey moderates the conversation and takes questions from Heritage Foundation members, Heritage Action Sentinels, and other online viewers. Heritage launched Conversations with Conservatives in March 2012 because too often the “mainstream” media won’t cover issues important to conservatives. Conversations with Conservatives gives members of Congress an opportunity to talk directly to an audience and avoid the liberal media’s filter. The Daily Signal covers each meeting. Conversations with Conservatives is aligned with Heritage’s strategic goal of expanding our reach to and influence on Congress. By moderating the conversation, we ensure Heritage’s priority issues are discussed and relations with conservative offices remain strong. The next broadcast of Conversations with Conservatives will take place on Wednesday, March 6, at noon. The topic is health care and will feature conservative doctors in the U.S. House: Congressman Paul Gosar of Arizona, Mark Green of Tennessee, and Andy Harris of Maryland. What questions or ideas would you like us to share at the next meeting? The liberal democrats or swamp creatures trying to look like white inocent and pure are the oposite. A government health care plan can not be efficient. The citizens of the United States need good, economical coverage that is timely for all people and not controlled by politicians and non-medical professionals. Even private insurance plans today delay or deny needed treatment. With private insurance, a person can at least change providers. I feel that since the fall of the Berlin Wall, we are no longer pointing out the differences between Communism and Capitalism. We keep saying the rich need to pay their fair share. We really need to continually remind people what the rich to pay for… Military, infrastructure, government, social programs…. Please ask, then answer what someone with $250,000 does with their money that is bad for our country. Please point out social programs that are going unused or are having no impact when someone says they can’t get ahead in this country. The abortion industry should be declassified from their tax-exempt status. They should be scrutinized for their barbaric practices in handling the remains of the innocent murdered humans. They should be investigated for their misleading profiteering/racketeering in the trade of the body parts, tissues and fluids. Why won’t the Republican Senate initiate needed legislative changes to immigration policies now instead of waiting for President Trump? Our national debt. How long before our money is devalued. I believe that technically this country is borderline bankrupt if it is not already. I’ve read that when a country reaches a taxation level of 50% the government soon fails. I believe we are at that level, and combined with the national debt, I wonder how long the U.S. will survive as a constitutional government. Within the Georgia GOP we are beginning to have county Conventions leading to the State one. We present resolutions as approved up the line. What does Heritage think would be a good resolution(s) for us to do? We intend to do right to life as per Constitution, but with others and to refine this will be helpful..
Can you talk about why there was little to no action by the Senate on H.R. 36 (National Reciprocity). I personally believe the perfect time to pass that was during the first two years of the Trump Administration, it would have solidified the Trump Administration 2A bona fides and corrected a major injustice in the area of 2A rights. What is happening on the Cosat Rica and Nicauraqua border concerning new canal? Pres. Tromp made a very good SOTU address. The remarks of the two congressmen were excellent, and I agreed with all of them. Most important: Trump should not back down on the wall. Close down the government all year if needed. Don’t approve MR 1, the people’s bill, and don’t approve funds for the liberal agenda. Why not cut spending? Get serious about eliminating programs that are unconstitutional: EPA, Education, Energy, IRS? to name a few. Members of the House of Representatives who are sworn to uphold the U.S. Constitution are not doing so and should be reprimanded for their actions. It should not take an election or a poll to make this happen. Thanks for all you do! Democrats / Progressives are the party of atheism, abortion, and absolute power. Their actions deny the existence of the Judeo-Christian deity and His moral principles. They claim to know what is true and false, what is good and bad, what you can and cannot have. They demand revenge for the misdeeds of our ancestors. They deny the value and importance of human lives today. they have slaughtered millions, ended in economic collapse or in blood and rubble. Groups and nations accepting and living by Judeo-Christian principles, believing in human potential, encouraging individual thought and effort, have prevailed and prospered. Who is strong enough to stand against those who wish to order us around? So far, only Trump.